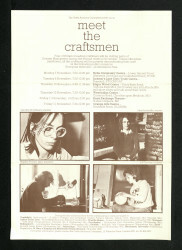 Leaflet titled 'Meet the Craftsmen: David Leach, Potter' including a biography of David Leach, description of his work, list of exhibitions, places to buy his work, suggested reading, glossary and images. 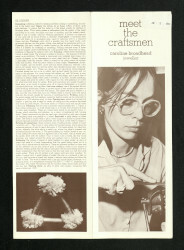 The front of the leaflet features a photograph by John Anderson of David Leach at work. Printed in sepia tone ink.